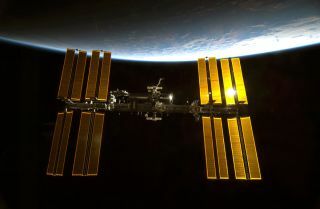 The International Space Station (ISS), photographed by an astronaut aboard the space shuttle Endeavour on Feb. 10, 2010. Astronauts who flew on ISS and space shuttle missions experienced changes in brain volume, a new study has found. It appears that spaceflight really goes to astronauts' heads. "We found large regions of gray-matter volume decreases, which could be related to redistribution of cerebrospinal fluid in space," study principal investigator Rachael Seidler, a professor of kinesiology and psychology at the University of Michigan, said in a statement. "Gravity is not available to pull fluids down in the body, resulting in so-called puffy face in space," Seidler added. "This may result in a shift of brain position or compression." Seidler and her team studied magnetic resonance imaging (MRI) scans of 26 astronauts — 12 who flew on two-week-long space shuttle missions, and 14 others who lived aboard the International Space Station (ISS) for five to six months. These MRI scans are the first images ever to show how spaceflight changes brain structure in humans. Blue shows areas of gray-matter volume decrease, likely reflecting shifting of cerebrospinal fluid. Orange shows regions of gray-matter volume increase, in the regions that control movement of the legs. The brain regions that expanded are associated with the control of leg movement and the processing of sensory information from the lower body, team members said. Therefore, the MRIs are likely capturing the brain learning a new skill — how to move in microgravity— and doing so around the clock, Seidler said. "It's interesting, because even if you love something, you won't practice more than an hour a day," she said. "In space, it's an extreme example of neuroplasticity in the brain, because you're in a microgravity environment 24 hours a day." It's unclear how long these changes last after astronauts come back to Earth, or how the shifts may affect cognitive ability, the researchers said. Seidler and her team are currently conducting another long-term study to look into these questions. The new study was published in December 2016 in the journal Nature Microgravity. The lead author is Vincent Koppelmans, of the University of Michigan's School of Kinesiology.